Creform bolt on AGV drive units are designed to attach to either custom made carts or existing carts that meet size, weight and clearance requirements. They follow a magnetic tape guidepath that can be modified as needs change. Units are available in forward only, forward/reverse and crab styles. Specifications for all models are linked on the left column. 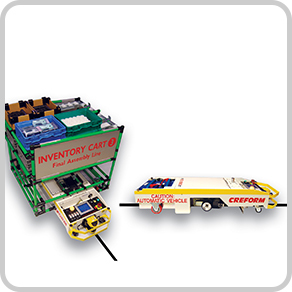 Like all Creform structures, Creform AGV carts can be built to exact specifications that can include powered load and unload conveyor systems and be part of plant-wide traffic control systems. 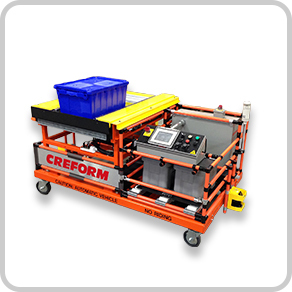 Creform BST AGVs are a cost effective alternative to individually controlled AGVs because one drive unit can mobilize a fleet of carts. Like all Creform AGVs they follow a magnetic tape guidepath located on the floor that is easily altered or modified as needs change. BST units drive up under a stationary cart equipped with a BST interface located under the cart, extend a tow pin and drive away with the cart, delivering it to a predetermined location. It then retracts the tow pin and drives off to mobilize other carts.